I started a new altered book art journal earlier this year, but I found as I got further into it that the pages were just too thin, so I'm not too happy with how they hold up under paint and glue. I'll have to cut out the pages I have done and add them to another journal. 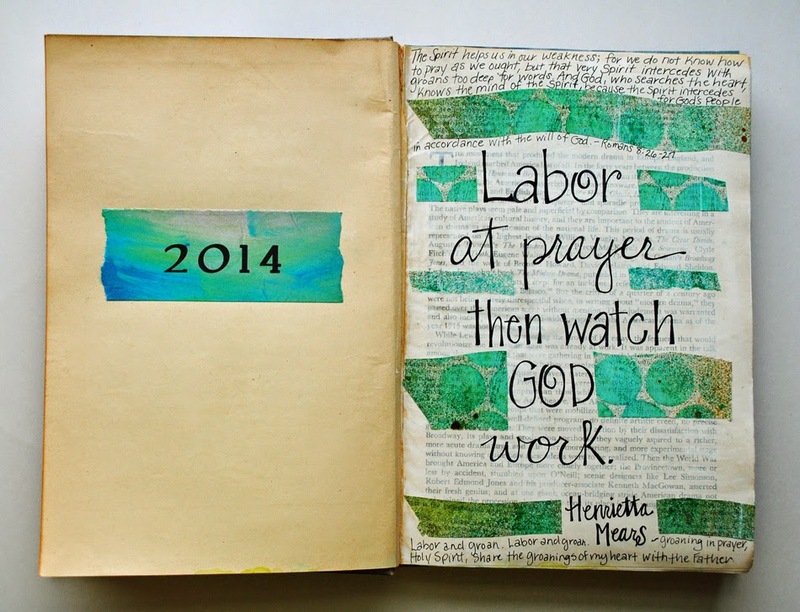 I mainly have been plugging along keeping up with my journal for the Documented Life Project. Here are the pages I finished this weekend as I work to catch up. 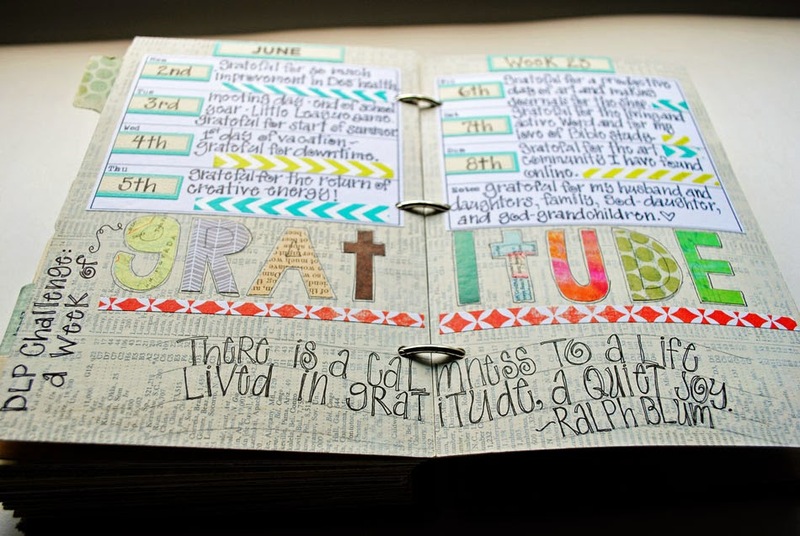 The challenge for week 23 was to practice gratitude and write what we were grateful for each day. 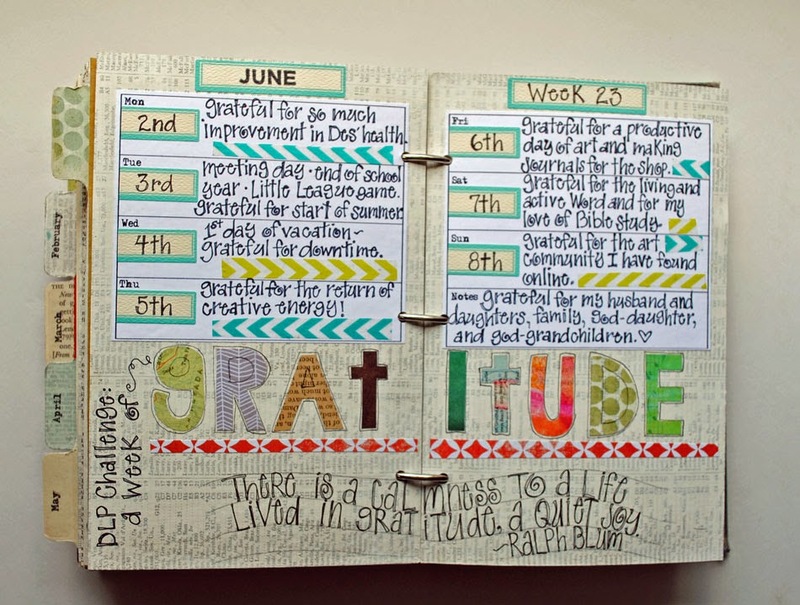 So, for week 23 I combined the challenge with my planner pages. And had some fun with cut-out letters! I find cut-out letters to be a relaxing activity and I'm always pleased with the results. In April I made a new altered book binder journal so I could take step-by-step pictures for the tutorial I made. 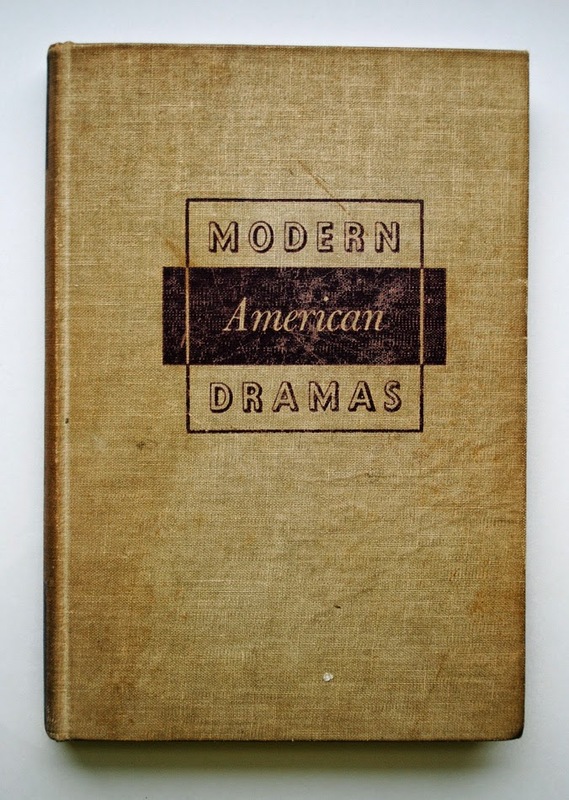 I have been working on a few pages here and there in that journal as well. Tomorrow I go back to the office and meetings after a 10 day break. It was a good period of rest and renewing my energy....I could go for another week! If all goes well through the week I intend to have part 2 of the Altered Book Journal tutorial done and posted by the weekend. I like the combination of print and cursive. Glad you got some well deserved time off - it sounds like it really benefitted you. Love your pages Mary. Looking forward to Part 2 of your tutorial. Thank you so much for sharing. Mary I really, really love these pages! I especially love the quote from Artisan Soul. I can understand what you were talking about doing a "spread" versus the binder, but I truly believe that you can still do a "flow" if you will from page to page even with the binder. Not quite the same, but "the feel" would be there! It probably doesn't matter anyway because ALLL of your pages are so fabulous!! LOL!! Thanks for your wonderful inspiration! Thank you, Felicia! 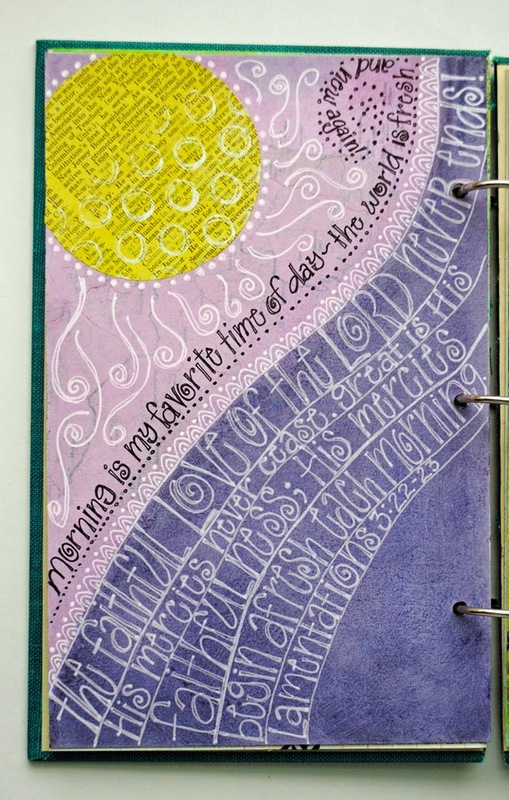 You're right about the page spread in a binder journal and I have done some that way. I think the bottom line is that I like both kinds of journals and having an excuse to make a new one! I love starting new things! 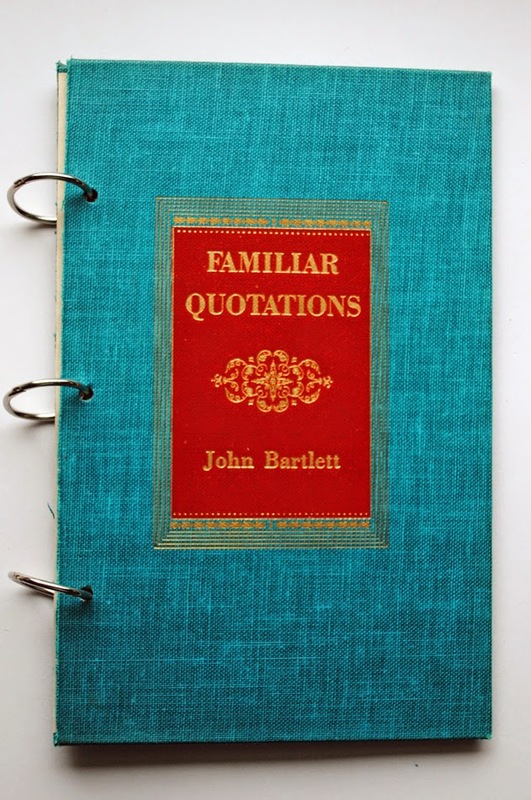 There is also an advantage to doing an altered book journal that is not a binder in that I son't have to glue book pages to paper to make pages. I just have to glue some together, brush on some gesso and I'm all set to go! Thanks for following along on my art journey! I always look forward to your posts; thank you for so generously sharing. 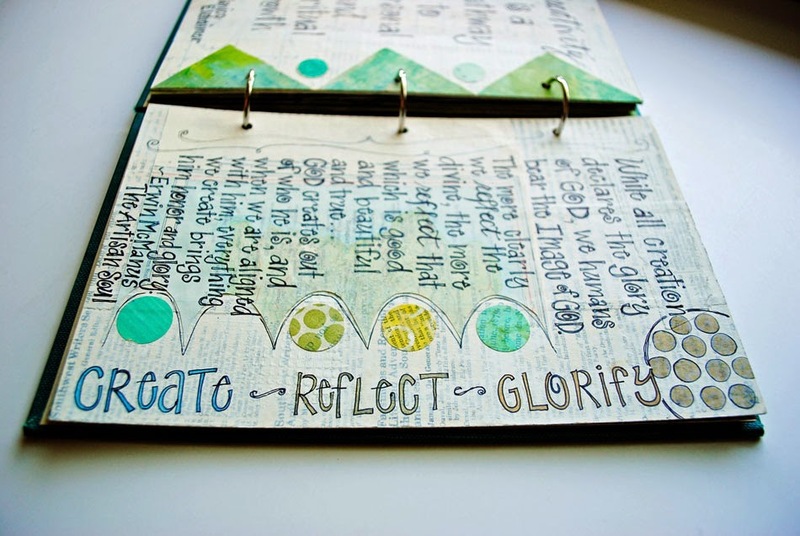 Looking forward to part 2 of the altered book journal. Especially love your use of white space. 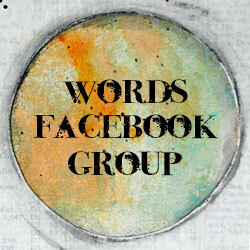 As always, I love your pages, Mary! 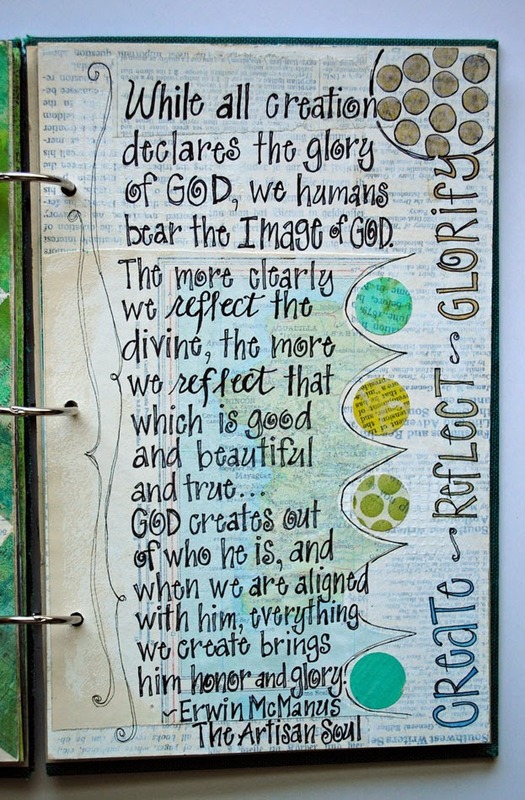 I especially love the morning page.....the colors and scripture are my favs. I'm so looking forward to your tutorial so I can observe and learn from your creative process. Also, I ordered some papers from your etsy shop. Please check to see if you received my order. It says it didn't go thru but my bank account was charged. Thanks! Thanks for your comments! You are always so faithful in leaving me encouragement! Can you send me an email with your actual name so I can check on the order? marybrack@gmail.com. And thanks for the order! I received my luscious papers today! OMG! They're gorgeous! When the budget allows, I'll be placing another order! Have a lovely, creative weekend.